Capillary film is a light sensitive film, used in place of liquid emulsion to create a screen printing stencil. It is so named because when when applied to a screen with water, it adheres to the mesh by capillary action. An advantage of capillary films over emulsion is that they have predetermined, consistent thickness and surface qualities as a result of being manufactured to factory specifications. 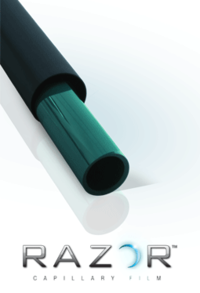 However, capillary film has the disadvantage of generally being applied from only the substrate side. This means that it does not have the same adhesion qualities as direct emulsions. As a result, stencil wear and durability can be an issue with capillary films on high volume print runs. Alpha Micro-Cap D is part of Chromaline’s portfolio of Alpha high resolution products for industrial and printed electronics applications. All Alpha Micro-Cap Series films improve screen efficiency with the easiest application and screen-to-screen consistency, while optimizing emulsion over mesh (EOM) for improved ink/paste release and higher quality prints. Alpha Micro-Cap D provides a large exposure window, making for consistent results when dealing with multiple applications. Alpha Micro-Cap S is part of Chromaline’s portfolio of Alpha high resolution products for industrial and printed electronics applications. All Alpha Micro-Cap Series films improve screen efficiency with the easiest application and screen-to-screen consistency, while optimizing emulsion over mesh (EOM) for improved ink/paste release and higher quality prints. Alpha Micro-Cap S’s short exposure times provide high efficiency for volume screen making. Direct/Indirect A Series is a two-part stencil system consisting of formulation-matched film and emulsion. The film assures excellent print quality; the emulsion offers excellent durability. The A Series is designed for low to mid-range mesh counts, and is well suited for general purpose printing and a medium ink deposit. 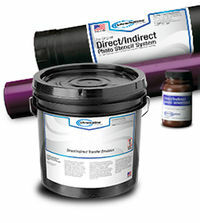 Direct/Indirect B Series is a two-part stencil system consisting of formulation-matched film and emulsion. The film assures excellent print quality; the emulsion offers excellent durability. The B Series is designed for low to mid-range mesh counts, and is well suited for general purpose printing, halftone with medium ink deposit, opaque and heavy ink laydown, solder mask, and textile applications. Direct/Indirect D Series is a two-part stencil system consisting of formulation-matched film and emulsion. The film assures excellent print quality; the emulsion offers excellent durability. The D Series is designed for higher mesh counts, and is well suited for fine halftones, detailed line art and UV printing. MagnaCure, is a photopolymer/diazo based, dual cure photostencil system offering remarkable image quality and exceptionally durable stencils. MagnaCure pre-sensitized capillary film is for printers demanding a premium quality stencil. Also available in custom sheets pre-cut to your specifications. Sold by the square inch, 100 sheets per box. 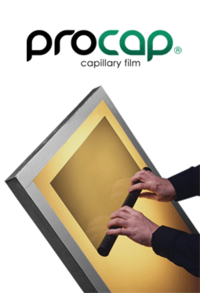 ProCap is a pre-sensitized capillary film for screen makers demanding high edge definition and reliable durability at a competitive price. Pre-sensitized diazo capillary film from Chromaline is designed for compatibility with plastisol and solvent based inks. Printers will appreciate its “workhorse” durability for demanding print runs and its user friendly convenience. 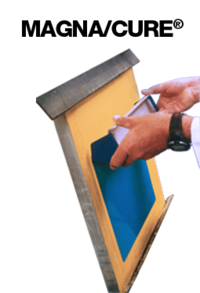 Razor capillary films are pure photopolymer stencil systems which provide high resolution, image quality and excellent shelf life. It is non-blocking and has excellent adhesion to a variety of meshes including polyester and stainless. SuperPHAT Film is ideal for heavy ink deposit and works well for textile printers using high density and special effects inks. 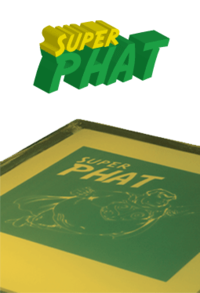 SuperPHAT’s ability to accomplish extreme stencil build-up benefits electronics and industrial printers as well. FOTECAP 4500 Ruby capillary film is red and specifically designed for the most demanding industrial printing applications. More specifically, Ruby is meant for manufacturers of touch screen displays and solar cells, as well as membrane switches and graphic overlays. This series includes products like FOTECAP 4515, FOTECAP 4520, FOTECAP 4525, and FOTECAP 4540. These dual-cure films provide stencils with excellent resolution and definition and are suitable for the most demanding graphic and industrial printing applications.